Directions: Park at the NRA Visitor Center on Hwy 199 in Gasquet. Trailhead is slightly east of the office and across Hwy 199. Access to the top of the trail on French Hill Rd: Drive 2.2 miles west of the Visitor Center, take French Hill Rd. (milepost 12.23) for 4.48 miles. Trailhead is on the left. Across the street from the US Forest Service Visitor Center in Gasquet is the trailhead to French Hill Trail. Stone pedestals and a trail marker let you know you’re in the right place. Gardens of thimbleberries pack the edges of the lower trail, supplying a snack to hikers in the summer of light and luscious red berries. The berry thickets give way to a low understory of ferns and salal under a canopy of Douglas Fir as the trail begins to climb. And climb it does! A walk on this trail means you’re either gaining in elevation or descending, there is rarely a flat moment. This historic pack trail was built to transport supplies from the Gasquet Ranger Station to construct the Camp 6 Lookout on French Hill. Switchbacks will have you weaving your way up the hill for nearly three miles before reaching a plateau where the trail dead ends at French Hill Road. The grade is fairly consistent along the way and the trail is well maintained and smooth. 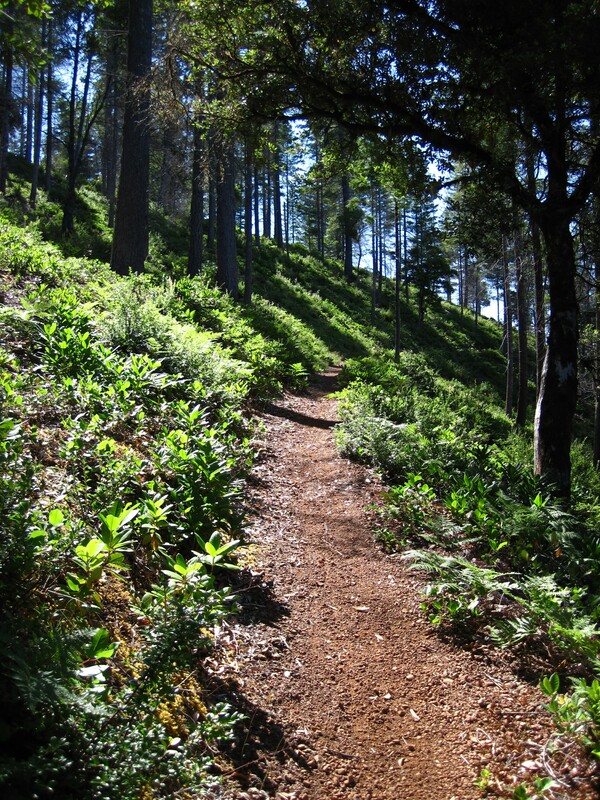 Starting at 400 feet of elevation the trail climbs 1,600 vertical feet to a high point of 2,000 feet above sea level. 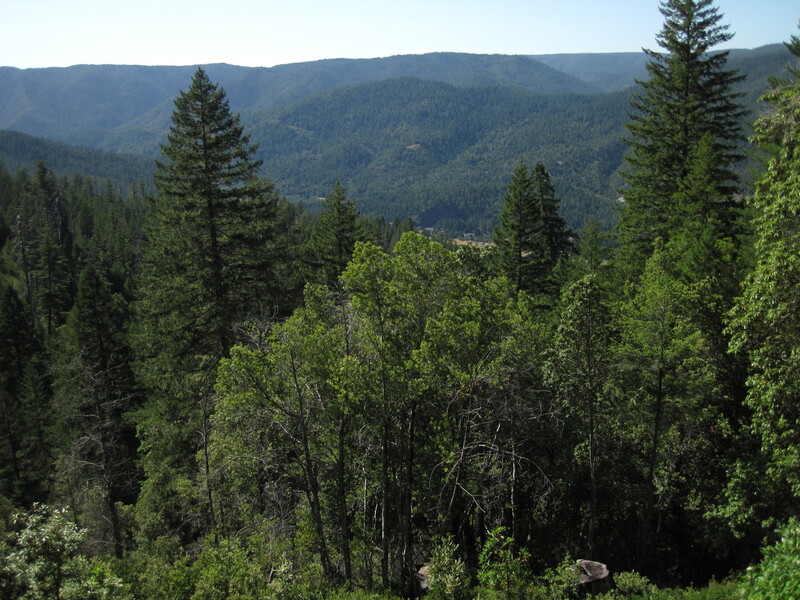 Occasional vista points near the top of the climb offer views to the northwest of the Siskiyou Mountains and Hardscrabble Creek watershed. French Hill Trail is excellent training grounds for mountain bikes, though riding it as a loop using the trail for the uphill is recommended as to not barrel down on unsuspecting hikers. Bikes can ride up the trail and make their descent down four miles of the milder, graded French Hill road to meet up with Hwy 199. Peddling two and a half miles east on 199 will take you right back to the official trailhead. Locating the trail at the top of French Hill Road can be difficult because the trail is hard to locate. It is not marked with a trail sign and it’s easy to miss in the homogenously forested area.